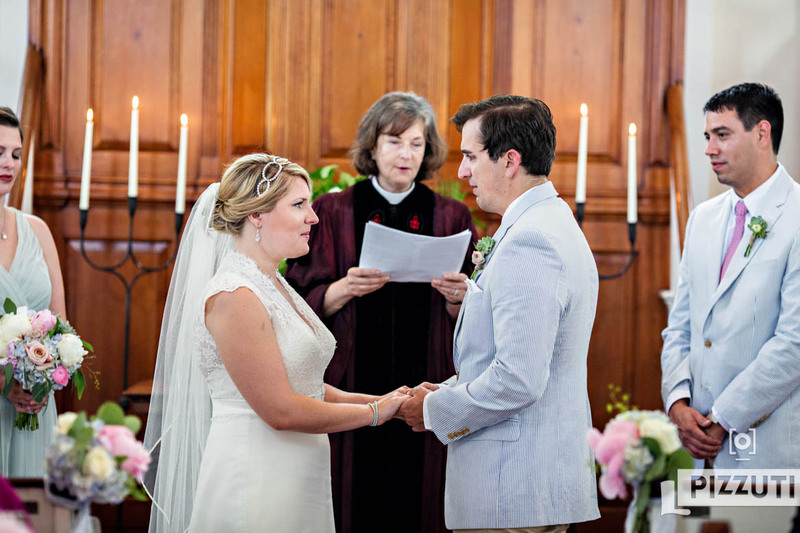 Ashley and Bill planned a beautiful Atlantica Wedding in Cohasset, MA. I felt right at home with Ashley, Bill and their friends and family. One of the perks of this job is that we as wedding photographers have the opportunity to share in the emotions and energy of the events in which we work. Sometimes I feel like I’ve known our couples and their friends for decades when it’s only been a few hours. Looking back on this wedding day it’s hard for me to remember another time when I entered a home, never before meeting any of the people, and been more accepted and warmly received. These two are a couple who’s love you can feel when they enter the room. And when the minister asked Bill if he would take Ashley to be his wife, his emphatic “ABSOLUTELY!” was so genuine and enthusiastic that the entire congregation at the First Parish of Cohasset erupted with laughter and joy. Many grooms put out a nervous “yes” when asked that question, but not Bill. It had been a very easy day so far and at that point I knew the rest of the day was going to be a lot of fun and full of energy. The reception did not disappoint. The dances and speeches were heartfelt and emotional and I will admit that there was a point where I had tears coming down my face. Here I am, basically a stranger to this crowd, but their collective openness and warmth allowed me to share in the prevalent emotions. My nature is to wear my heart on my sleeve, but I usually can keep it together… not this day. I was honored to be able to make photographs at this wedding and it’s one that I won’t soon forget. Congratulations to the bride and groom! Here are some of my favorite images of this day.